The majority of my time is spent debugging web-apps and doing graphic design, but every now and then I get to switch it up a bit with some computer hardware projects. 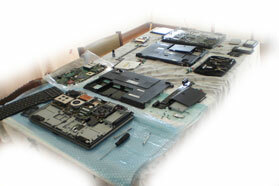 This project involved taking 2 broken laptops from the Fujitsu N series and turning them into something special. 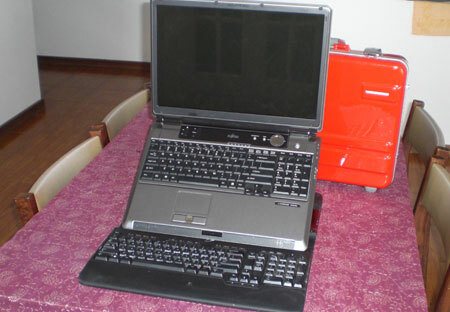 The laptops started as Fujitsu N6410 and were upgraded to the equivilent of an upgraded N6460. As you can see the original specs were pretty weak but Fujitsu did us a solid but NOT upgrading their chassis and many other things, they only upgraded the hardware on the N series of laptops. This means you can find laptops with a broken screen on ebay, take everything out and put it in your chassis with working screen and boom new computer. This was not good enough for me though because there were a couple basic things even the new N series lacked like bluetooth. So I set about to find the smallest USB bluetooth and an internal TV Tuner. The N series have a free internal USB connection, some boards even have a connector. Without the connector you have to either surface mount a connector or solder direct to the board.